Lydgate was a monk and a poet, not a horseplayer. Had he been, I doubt he would have been so optimistic. Racing fans, it seems, can’t be pleased at any time. Case in point: Game On Dude. Here’s a seven-year-old gelding that does what every racing fan clamors for — he competes. Game On Dude has raced 31 times and averaged over six starts per year since he debuted on Jan. 23, 2010. He has raced at Gulfstream Park, Churchill Downs, Lone Star Park, Belmont Park, Charles Town, Hollywood Park, Del Mar, Santa Anita… he’s even raced at Meydan Racecourse in Dubai. The son of Awesome Again has won prestigious races like the Pacific Classic, the Hollywood Gold Cup (twice) and, just a few days ago, he became the first horse in history to win the Santa Anita Handicap three times. That’s something John Henry couldn’t do in his three attempts (1981, 1982, 1984); Seabiscuit couldn’t do (1937, 1938, 1940); Cougar II couldn’t do (1971-73). Yet, in the aftermath of Game On Dude’s magnificent triumph, all I heard about was the “souped-up” racetrack at Santa Anita — a track that many believe aided Game On Dude in his stakes-record clocking of 1:58.17 for 1 ¼ miles. 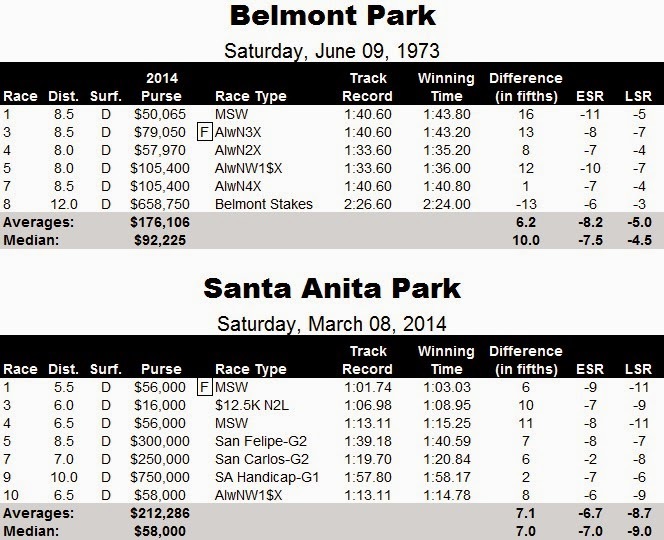 OK, the track was very fast at Santa Anita on March 8, 2014… so what? Souped-up racetracks have been a part of the game since time immemorial. In fact, the best performance in the history of American racing (at least in my opinion) came over an ultra-glib racing surface. Secretariat may have moved like a “tremendous machine” in winning the Belmont Stakes on June 9, 1973, but there is little doubt that the track — and probably, more specifically, the wind — played a major role in his record-shattering 12-furlong time of 2:24 that day. 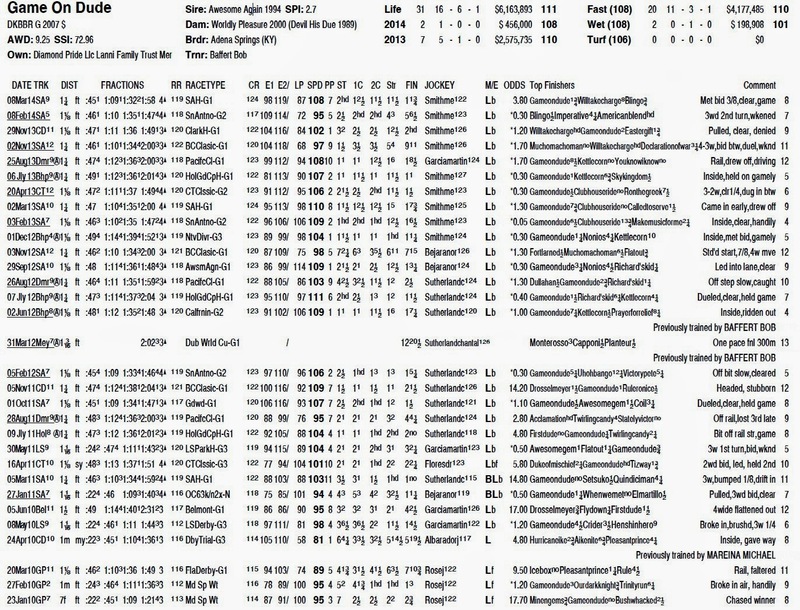 Using inflation-adjusted purse values as a guide, it’s arguable that the quality of racing on the dirt was actually a bit better on the day that Game On Dude notched his third Big ‘Cap than on the day that Secretariat became a Triple Crown champion. But look closely at the pace figures (my ESRs and LSRs). Notice how, on June 9, 1973, every single dirt race had a positive pace profile (higher LSR than ESR). This is highly unusual and generally only seen in higher class races or at tracks with configuration or timing quirks. In fact, at Santa Anita, only two races featured positive profiles and both were graded stakes — the Grade II San Felipe and the Grade I Santa Anita Handicap. What’s more, the times were fairly similar on June 9, 1973 and March 8, 2014 too. So where’s the uproar over Big Red’s Belmont time? Where’s the angst over his scintillating performance? 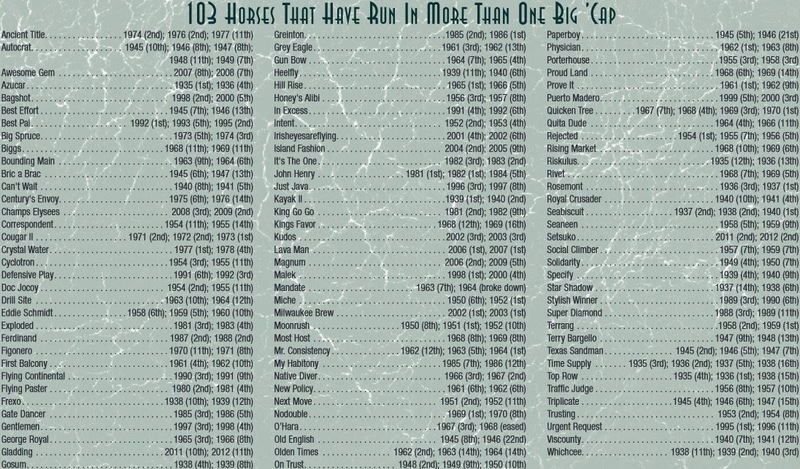 Look, I get it: Game On Dude is not Secretariat… but he’s not exactly Zippy Chippy either. Is too much to ask for some of the racing fans out there to be happy some of the time and give credit to a horse that has accomplished something historic? Really those that don't want to give him credit many times are just looking for excuse for their losing tickets. I didn't have Game On Dude but respect the hell out of him for a great performance. All the horses ran over the same track. Horses are hard to figure. Thanks for putting a tiny hole in Secretariat's Belmont balloon. Big Red was fantastic but he certainly was far from invincible.